July 10, 2017 – Tonight, NASA’s Juno mission will fly directly over Jupiter’s Great Red Spot. The spacecraft will pass over the planet at 7:55 p.m. MDT, turning its science instruments to peer into the Solar System’s largest storm. 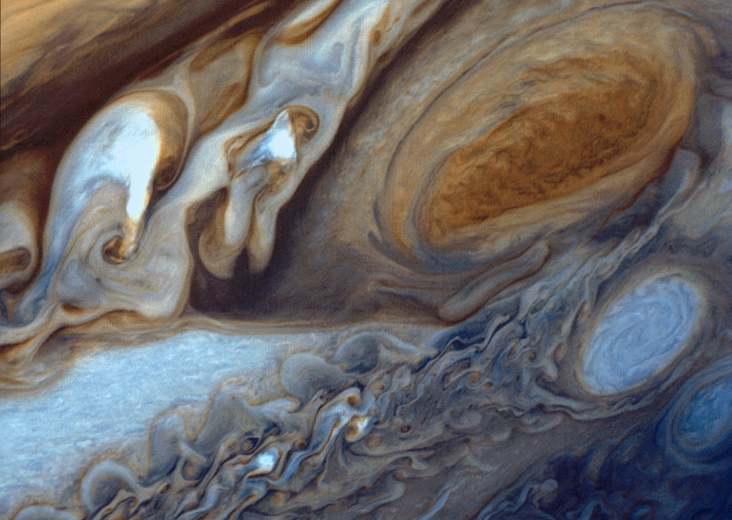 The Great Red Spot has been swirling over Jupiter’s skies for at least 150 years – possibly much longer – but very little is known about the storm, or what causes its reddish hues. The storm is so large that about 1.3 Earths could fit inside of it, and the storm’s tumultuous winds peak at about 400 mph. Jupiter’s clouds make it hard to gather clear observations of the planet’s lower atmosphere. In January and February 1979, NASA’s Voyager I spacecraft zoomed toward Jupiter, capturing images of the Great Red Spot during its approach. Still, no spacecraft has been as close as Juno is going to get tonight and there’s a lot of excitement about what the instruments will see. Juno launched on a United Launch Alliance Atlas V rocket on August 5, 2011, from Cape Canaveral, Florida, and arrived at Jupiter on July 4, 2016. The spacecraft is in a polar orbit around Jupiter, and the majority of each orbit is spent well away from the gas giant. But, once every 53 days, its trajectory approaches Jupiter from above its north pole, where it begins a two-hour transit (from pole to pole) flying north to south with its eight science instruments collecting data and its JunoCam public outreach camera snapping pictures. Each new orbit brings the spacecraft through an extremely harsh environment. During tonight’s pass, Juno will fly about 5,600 miles (9,000 kilometers) above the Giant Red Spot. In order to do this, the spacecraft’s communication systems will be facing away from Earth and it will be a few hours before the mission team receives confirmation that the spacecraft has survived the orbit and is still able to transmit data. As Juno flies away from the planet, it will begin downloading data, first from its magnetometer, and then from other instruments. The photos will be sent in chronological order, beginning with images taken as the spacecraft is approaching the planet, so the first close-up views of the Great Red Spot aren’t expected until July 14. But Juno’s mission team has learned to be patient and when the data arrives, it will give fascinating insight into Jupiter’s atmosphere and its iconic storm. Early science results from NASA’s Juno mission portray the largest planet in our solar system as a turbulent world, with an intriguingly complex interior structure, energetic polar aurora, and huge polar cyclones. Tonight’s pass is Juno’s sixth science orbit. Among a total of 32 passes, the Juno team hopes to pass over the Great Red Spot at least two more times. Lockheed Martin Space Systems of Littleton, Colorado built the spacecraft and Sierra Nevada Corporation’s electronic-free thermal devices are critical to keeping the spacecraft’s temperature regulated without drawing power away from the spacecraft’s scientific payloads. Several CU Boulder faculty and students are also involved in the mission. JPL manages the Juno mission for the principal investigator, Scott Bolton, of Southwest Research Institute. The Juno mission is part of the New Frontiers Program managed by NASA’s Marshall Space Flight Center in Huntsville, Alabama, for the Science Mission Directorate.